I will be recognizing the U.S. Travel Association with the Certificate of Appreciation for Achievement in Trade for outstanding contributions to international travel and tourism and U.S. travel and tourism exports. We are very excited about the expanding relationship between the U.S. Travel Association and the Department of Commerce. This relationship is a tremendous example of a public-private partnership that produces direct results for America. We believe this growing relationship will only enhance the success of the International Pow Wow in the years ahead. 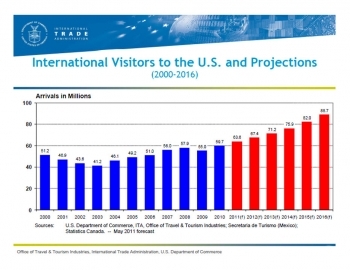 We released the new travel forecasts today, and according to the data, the U.S. can expect 6-8 percent average annual growth in tourism over the next five years, and this year, 64 million foreign travelers are projected to visit the United States, spending $144 billion during their stays, setting a new record for travel exports. The travel and tourism industry is a large component of President Obama’s National Export Initiative of doubling exports by the end of 2014, supporting million of jobs. Nearly 8 million people in the United States are employed in travel and tourism industries, and 1.2 million are tied directly to international travelers. Submitted on May 31, 2011 - 10:14am. Using math problems as captchas is not a good idea. Computers can solve those, often faster and more accurately than humans. You need to use those squiggly words that you see on other websites to allow people to prove that they are in fact human. Submitted on June 1, 2011 - 10:45am. We have found that our math captcha does a very good job of keeping out spambots. Additionally, it is easier for those with visual impairments to read and use. Submitted on June 1, 2011 - 9:34am. This has nothing to do with Native Americans. Why are you calling it a Pow Wow? It seems disrespectful. Submitted on June 1, 2011 - 10:46am. The Department of Commerce didn't name this event. The U.S. Travel Association is responsible for the name and the event. You can contact them with your concerns.